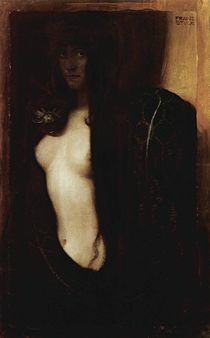 The Sin, 1893 painting by Franz von Stuck. Sin is a term used to describe either an action that is prohibited in religious ethics or law, or a fallen state of being. The religious concept of sin is tied to a cluster of interrelated issues including atonement, theodicy, free will, ethics, guilt, and law. Although many religions contain concepts of sin (or a parallel ideas such as alienation or karma), it is also true that the notion of sin has evolved over time and has been interpreted in many ways. Consequently, sin is a complex issue that works on different levels and presupposes certain theological, metaphysical and epistolomigical ways of viewing God, the world, creation, law, and humanity's connection to all of the above. Different theories on the origin of sin have been proposed by world religions. Hinduism and Buddhism relate sin to karma: it is the baneful result of one's misdeeds in both the present life and in one's past lives. The monotheistic religions believe that human sinning is volitional because of free will, while at the same time they attribute the power of sin to the works of the Devil. Christianity teaches that sin entered the world with the fall of Adam and Eve; this is called Original Sin. Among the monotheistic religions, the chief among all sins is either rebellion against God—manifest as pride, disobedience, or idolatry. Sometimes sexual transgression is placed at the top of the list. Thus, while in the majority Christian opinion the fall of Adam and Eve consisted in their disobedience to a particular commandment of God, notable early Church Fathers such as St. Clement of Alexandria (c.150–215) and St. Ambrose (c. 339–397) went so far as to say that it involved a sexual sin. All religions teach that humans suffer a penalty for their sins, either through karma that "ripens" in a future life (Hinduism and Buddhism), through some misfortune in the present life, or by being cast into Hell. All religions, however, teach their followers to avoid committing sin and prescribe a path to eradicate accumulated sin—in other words, a doctrine of atonement. This gives rise to hope. Different languages have their respective words for sin. In the New Testament, the Koine Greek word for sin is hamartia, which means "to miss the mark," although some say that this translation is not adequate. In other research, this word has been associated with the "hem" of a garment. It is rather in Classical Greek that the word hamartia means "to miss the mark" or "to miss the target," which was also used in Old English archery. The word sin derives from Old English synn, recorded in use as early as the ninth century. The same root appears in several other Germanic languages, e.g., Old Norse synd, or German Sünde. There is presumably a Germanic root *sun(d)jō (literally "it is true"). The word may derive, ultimately, from *es-, one of the Proto-Indo-European roots that meant "to be," and is a present participle, "being." Latin also has an old present participle of esse in the word sons, sont-, which came to mean "guilty" in Latin. The root meaning would appear to be, "it is true;" that is, "the charge has been proven." Judaism regards the violation of divine commandments to be a sin on the part of human beings who have God-given free will, the ability to choose between good and evil. Although God expects humans not to choose evil, they must contend with the inclination towards evil, the yetzer ha-ra, which is implanted in every soul. As to the source of the evil inclination the rabbis have various views: some believe it to be part of the human endowment at creation due to the "shattering of the vessels" in primordial time (see Kabbala); some view it as a weak desire that was unnaturally strengthened due to the fall of Adam and Eve; others see it as a vulnerability to the temptations of an angel called Satan (haSatan). Humans are given a great opportunity during their earthly lives to exert their free will to overcome this evil inclination and choose the good, so that they may be able to inherit the good world in the end. The generic Hebrew word for any kind of sin is avera (literally: transgression). There are three categories of a person who commits an avera. The first one is someone who does an avera intentionally, or "B'mezid." This is the most serious category. The second is one who did an avera by accident. This is called "B'shogeg," and while the person is still responsible for his or her action, it is considered less serious. The third category is someone who is a "Tinok Shenishba," a person who was raised in an environment that was assimilated or non-Jewish, and is not aware of the proper Jewish laws, or halacha. This person is not held accountable for his or her actions. In addition, Jewish law prescribes seven precepts for non-Jews (gentiles) called the Noahide Laws, which must be followed for righteous gentiles to have a share in the world to come. Cheit—This is an unintentional sin, crime, or fault. Judaism holds that no human being is perfect, and all people have sinned many times. However, certain states of sin (i.e., avon or cheit) do not condemn a person to damnation; only one or two truly grievous sins lead to damnation. The scriptural and rabbinic conception of God is that of a creator who tempers justice with mercy. According to the Hebrew Bible, rituals for atonement were performed in the Temple in Jerusalem, officiated by the Kohanim, the Israelite priests. These services included song, prayer, offerings, and animal sacrifices known as the korbanot. The rites for Yom Kippur, the Day of Atonement, were prescribed in the book of Leviticus chapter 16. The ritual of the scapegoat, sent into the wilderness to be claimed by Azazel, was one of these observances (Leviticus 16:20–22). The Hebrew Bible teaches that it is possible to return to God through repentance and prayer alone. For example, in Jonah and Esther, both Jews and gentiles repented, prayed to God, and were forgiven for their sins, without having offered any sacrifices. Judaism since the beginning of the Common Era prescribes prayer, repentance, and tzedakah (charitable actions) as ways to repent for sin. Repentance is particularly emphasized on the High Holy Days of Rosh Hashanah, Yom Kippur, and the ten-day period between these holidays called the "Days of Awe." In Judaism, sins committed against people (rather than against God or in the heart) must first be corrected and put right to the best of a person's ability; a sin that has not also been put right as best as possible cannot truly be said to be repented. The Greek word in the New Testament that is translated in English as "sin" is hamartia, which literally means "to miss the mark." This means that sin is actually disobeying God's laws, as long as they are the mark that should not be missed (i.e., the Ten Commandments and the teachings of Christ, especially his teaching of love, which is the whole of the law). So, 1 John 3:4 states: "Everyone who makes a practice of sinning also practices lawlessness; sin is lawlessness" (English Standard Version). The benchmark for sin is the biblical account of Adam and Eve who disobeyed God's commandment, by eating the fruit of the Tree of the Knowledge of Good and Evil. Their sin was not caused by God but rather by their own free will. Satan is said to have tempted Eve, but the ultimate source of sin is free will. Satan was created as a good angel (sometimes called Lucifer) who rebelled against God and became Satan. The fall of Adam and Eve centering on Satan thus consisted in their volitional disobedience to God's commandment. As to what the prohibition, symbolized by a "fruit," could mean, some Church Fathers such as St. Clement of Alexandria and St. Ambrose held that it involved their illicit sexual relationship. Their sin has been inherited to all their offspring as Original Sin, which is so binding that humans are in depravity. Original Sin and sinfulness have serious consequences in three main areas: (1) the sinner's relationship with God, (2) the sinner's relationship to others, and (3) within the sinner himself or herself. In the first area, the sinner became guilty as "an enemy of God" (James 4:4), being "hostile to God" (Romans 8:7; Colossians 1:21) and having "the wrath of God" rest upon him or her (John 3:36; Romans 1:18). This separates the sinner from God, resulting in spiritual death, which, without regeneration, could be made eternal in "the eternal fire" in Hell (Gospel of Matthew|Matthew]] 25:41). Many Christians believe that even physical death is a consequence of sin, by taking literally Genesis 2:17: "for in the day that you eat of it you shall die." In the second area of relationship, sinners became enemies to one another, not loving one another but fighting with one another: "What causes fights and quarrels among you? Don't they come from your desires that battle within you? You want something but don't get it. You kill and covet, but you cannot have what you want. You quarrel and fight" (James 4:1-2). A third consequence is upon the sinner himself or herself, and it can be called the corruption or pollution of human nature, which includes enslavement (Romans 6:17), self-deceit (Matthew 7:3), and self-centeredness. Because of Adam's sin all humans became sinners with those consequences. People are therefore in need of Christ's grace and forgiveness: "Consequently, just as the result of one trespass was condemnation for all men, so also the result of one act of righteousness was justification that brings life for all men" (Romans 5:18); "for all have sinned and fall short of the glory of God, and are justified freely by his grace through the redemption that came by Christ Jesus” (Romans 3:23–24). While many Christians take Original Sin seriously, others do not. Depending upon how they treat "guilt" and "corrupted nature," which are two important dimensions of Original Sin, there are four different views on the magnitude of Original Sin. Guilt means that people are all guilty of the sin of Adam and Eve, and corrupted nature means that human nature is corrupted as a result of that. Theory of natural headship—People have inherited both guilt and corrupted nature because they are naturally bound with Adam. Lutherans and staunch Calvinists adhere to this. It was also believed by some early Fathers such as Tertullian (c.155–230) and St. Gregory of Nyssa (c.335–394). According to this position, the natural linkage is such that the soul of a child is derived, through natural generation along with the body, from the souls of its parents. It is called "traducianism," coming from the Latin word tradux (shoot, sprout). St. Augustine (354–430) was leaning toward it, although he was not decided in actuality. The sexual interpretation of the fall of Adam and Eve by theologians such as St. Clement of Alexandria would fit well with the theory of natural headship, because the existence of a fallen lineage involving sexual coitus centering on Satan would explain it well. But this point has been absent in the discussion. Theory of federal headship—People have both guilt and corrupted nature, but it is only because they are bound by the covenant between God and Adam. Many Calvinists and Protestants take this position. Basically Catholics are with it. Instead of traducianism, "creationism" that believes that God directly creates the human soul is adhered to. Creationism was defended by medieval theologians in Catholicism. Arminianism—People have no guilt; they only have corrupted nature. Arminianism was named after Jacobus Arminius (1560–1609), a Dutch Reformed theologian who emphasized the importance of free will. Pelagianism—People have neither guilt nor corrupted nature. This is the most optimistic view. Pelagius, a contemporary of St. Augustine believed that people have no Original Sin, although they may be somewhat influenced by Adam's bad example. Roman Catholic doctrine distinguishes "personal sin" from Original Sin. Personal sins are either "mortal" or "venial." Mortal sins are sins of grave and serious matter, where the sinner is fully aware that the act (or omission) is both a sin and a grave matter, and performs the act (or omission) with fully deliberate consent. Mortal sins include adultery, murder, masturbation, contraceptive use, abortion, and deliberate heresy. The act of committing a mortal sin cuts off the sinner from God's grace; it is in itself a rejection of God. If left unreconciled through confession or perfect contrition, mortal sins result in eternal punishment in Hell. Venial sins, by contrast, are sins that do not meet the conditions for mortal sins. The act of committing a venial sin does not cut off the sinner from God's grace, as the sinner has not rejected God. However, venial sins do injure the relationship between the sinner and God, and as such, must be reconciled to God through any sacrament of the Church. Indulgences and purgatory also address the temporal punishment for venial sin. Roman Catholic doctrine also sees sin as being twofold: Sin is, at once, any evil or immoral action which infracts God's law and the inevitable consequences, the state of being that comes about by committing the sinful action. This is the well-known distinction between "actual sin" and "habitual sin." Catholic theology has also developed a list of what are called the Seven Deadly Sins, which are seven categories of sin corresponding to weaknesses in human nature: lust, gluttony, greed, sloth, wrath, envy, and pride. They are simply listed as acts to be avoided by all virtuous Christians, and they should not be confused with mortal sins. Protestantism has not classified various kinds of sin as in Catholicism, but it has traditionally stressed the seriousness of sin. Many Protestants teach that, due to Original Sin, humanity has lost any and all capacity to move towards reconciliation with God (Romans 3:23; 6:23; Ephesians 2:1–3); in fact, this inborn sin turns humans away from God and towards themselves and their own desires (Isaiah 53:6a). Thus, humans may be brought back into a relationship with God only by way of God's rescuing the sinner from his or her hopeless condition (Galatians 5:17–21; Ephesians 2:4–10) through Jesus' salvation. Salvation is sola fide (by faith alone); sola gratia (by grace alone); and is begun and completed by God alone through Jesus (Ephesians 2:8, 9). This understanding of Original Sin (Romans 5:12–19), is most closely associated with Calvinism (see total depravity) and Lutheranism. Methodist theology adapts the concept by stating that humans, entirely sinful and totally depraved, can only "do good" through God's "prevenient grace." This is in contrast to the Catholic teaching that while sin has tarnished the original goodness of humanity prior to the Fall, it has not entirely extinguished that goodness, or at least the potential for goodness, allowing humans to reach towards God to share in the redemption that Jesus Christ won for them. Some non-Catholic or Orthodox groups hold similar views. Ransom theory—St. Irenaeus (c.120–200), Origen (c.185–254), and others taught that the death of Christ on the cross was a "ransom" paid to Satan to defeat Satan's sovereignty over sinful humankind. The crucifixion of Christ was regarded only as one of the many redemptive events in his entire earthly life. This was the standard theory during the first 11 centuries of the Christian era. Some of its modern versions maintain that the original mission of Christ was not to be killed on the cross but to live and battle against Satan's rule in the world. Satisfaction theory—St. Anselm of Canterbury (1022–1109) taught that Christ's death satisfied God's offended sense of justice over the sins of humanity. In addition, God rewarded Christ's obedience, which built up a storehouse of merit and a treasury of grace that believers could share by their faith in Christ. Anselm's teaching is contained in his treatise Cur Deus Homo, which means Why God Became Human. Anselm's ideas were later expanded utilizing Aristotelian philosophy into a grand theological system by St. Thomas Aquinas (c.1225–1274) in the thirteenth century, particularly in his masterpiece Summa Theologica, which eventually became official Roman Catholic doctrine. Moral influence theory—Pierre Abélard (1079–1142) held that Christ's passion was God suffering with his creatures in order to show the greatness of his love for them. This view became popular amongst liberal Christians in the nineteenth and twentieth centuries. Penal substitution theory—John Calvin (1509–1564) and other Reformers owed much to Anselm's theory and taught that Christ, the only sinless person, was obedient to take upon himself the penalty for the sins that should have been visited on men and women. Calvin additionally advocated the doctrine of limited atonement, which teaches that the atonement applies only to the sins of the elect rather than to all of humanity. Governmental theory—Arminianism traditionally taught this. Drawing primarily from the works of Jacobus Arminius and Hugo Grotius (1583–1645), it teaches that Christ suffered for humankind so that God could forgive humans while still maintaining divine justice. Unlike the perspectives of the satisfaction theory and the penal substitution theory, this theory states that Christ was not punished for humanity, for true forgiveness would not be possible if humankind's offenses were already punished. Christ's suffering was a real and meaningful substitutionary atonement for the punishment humans deserve, but Christ was not punished on behalf of the human race. This view has prospered in traditional Methodism and all who follow the teachings of John Wesley (1703–1791), and has been detailed by, among others, nineteenth-century Methodist theologian John Miley in his classic Atonement in Christ. "Avoid the seven noxious things" and after having said this, the prophet (saw) mentioned them: "associating anything with Allah; magic [equivalent to witchcraft and sorcery in English]; killing one whom Allah has declared inviolate without a just case; consuming the property of an orphan; devouring usury; turning back when the army advances; and slandering chaste women who are believers but indiscreet." However, 'Abdullah ibn 'Abbas lists seventy sins, by saying, "Seventy is closer to their number than seven." It is believed that Iblis (Satan) has a significant role in tempting humankind towards sin. Thus, Islamic theology identifies and warns of an external enemy of humankind who leads humankind towards sin (7:27; 4:199; 3:55; etc.). The Qur'an in several verses states the details of the Iblis’s temptation of Adam (2:30–39; 7:11–25; 20:116–124), and argues that the Iblis’s pattern of temptation of man is the same as that of Adam (7:27). Muslims believe that Allah is angered by sin and punishes some sinners with the fires of جهنم‎ jahannam (Hell), but that he is also ar-rahman (the Merciful) and al-ghaffar (the Oft-Forgiving). It is believed that the جهنم‎ jahannam fire has purification functionality, and that after purification an individual who has been condemned to enter جهنم‎ jahannam is eligible to go to جنّة jannah (the Garden), if he "had an atom's worth of faith." Some Qur'an commentaries such as Allameh Tabatabaei state that the fire is nothing but a transformed form of the human’s sin itself. The Qur'an teaches that the main way back to Allah is through genuine tawbah (repentance), which literally means "to return" (39:53–54). Islam does not accept any blood sacrifice for sin. The Islamic understanding of forgiveness is that it is made on the basis of divine grace and repentance. According to Islam, no sacrifice can add to divine grace nor replace the necessity of repentance. In Islamic theology, the animal sacrifices or blood are not directly linked to atonement: "It is not their meat nor their blood that reaches Allah. It is your piety that reaches Him" (22:37). On the other hand, the sacrifice is done to help the poor, and in remembrance of Abraham’s willingness to sacrifice his son at God's command. In many verses of the Qur'an, Allah promises to forgive the sins of Muslims if they believe and do good works (47:2; 29:7; 14:23, etc.). Prayer and good deeds can also be atonements for sins (11:114). The Islamic Law, Sharia, specifies the atonement of any particular sin. Depending on the sin, the atonement can range from repentance and compensation of the sin if possible, feeding the poor, freeing slaves to even stoning to death or cutting hands. Some of the major sins are held to be legally punishable in an Islamic state (for example, murder, theft, adultery, and in some views apostasy). Most are left to Allah to punish (for example, backbiting, hypocrisy arrogance, filial disrespect, lying). It is said that for every good deed that is done, ten bad ones (sins) will be taken off. In Hinduism, the term sin or pāpa is often used to describe actions that create negative karma, or violate moral and ethical codes (adharma). Thus, pāpa is the closest Hindu idea to sin, although it operates within a different constellation of assumptions. “Hinduism does not view sin as a crime against God, but as an act against dharma—moral order—and one's own self." Furthermore, it is thought natural, if unfortunate, that young souls act wrongly, for they are living in nescience, avidya, the darkness of ignorance. Thus, sin in Hinduism is an adharmic course of action that automatically brings negative consequences. Satguru Sivaya Subramuniyaswami explains that the residue of sin is called papa, sometimes conceived of as a sticky, astral substance that can be dissolved through penance (prayashchitta), austerity (tapas), and good deeds (sukritya). Note that papa is also accrued through unknowing or unintentional transgressions of dharma, as in the term aparadha (offense, fault, mistake). He further notes that in Hinduism, except for the Dvaita school of Shri Madhvacharya, there are no such concepts of inherent or mortal sin, which he defined as sins so grave that they can never be expiated and which cause the soul to be condemned to suffer eternally in hell. Atonement in Hinduism involves a ritual of sacrifice, called yajna, which was more commonly practiced during Vedic times. It is performed to please the devas (gods), or sometimes, the Supreme Spirit Brahman. Having a more explicit purpose of atonement than yajna is the practice of prayaschitta (penance). When people commit sins violating the dharma, they practice prayaschitta, involving fasting, chanting of mantras (religious syllables), charity, pilgrimage, etc., in order to atone with the gods and also with their fellow humans. This penance is also understood to help them toward their liberation from the karma. There is no Buddhist concept of sin per se, although there are analogous ideas such as karma (action and its consequence) and demerit. In general, Buddhism does not recognize the idea behind sin because of its "Cause-Effect Theory," known as karma, which postulates that intentions are the cause of either good or bad actions. Thus, Aryadasa Ratnasinghe writes, "There is nothing called 'sin' in Buddhism in which actions are merely termed as meritorious ('kusala') and demeritorious 'akusala')." Vipaka, the result of one's karma, may create low-quality living, hardships, destruction, and all means of disharmony in life and it may also create healthy living, easiness, and harmony in life. Good deeds produce good results while bad deeds produce bad results. lobha: greed, lust (rāga), attachment. moha: delusion, sloth, ignorance (avijjā). These three kilesas specifically refer to the subtle movement of mind (citta) when it initially encounters a mental object. (In Buddhist conceptions of the mind, “mental object” refers to any object that the mind perceives, be it a thought, emotion, or object perceived by the physical senses.) If the mind initially reacts by moving towards the mental object, seeking it out, or attaching to it, the experience and results will be tinged by the lobha kilesa. Unpleasant objects or experiences are often met by aversion, or the mind moving away from the object, which is the root for hatred and anger to arise in relation to the object. Buddhism, which is far from theism, has no real concept of atonement with God. It rather focuses on atonement with fellow humans, teaching the importance of forgiveness. So, people are supposed to practice mettā (loving kindness), karuna (compassion), and mudita (sympathetic joy) to go beyond the chain of karma. In the Bahá'í Faith, humans are considered to be naturally good, and intrinsically spiritual beings, created because of God's immeasurable love. However, the Bahá'í teachings compare the human heart to a mirror, which, if turned away from the light of the sun (i.e., God), is incapable of receiving God's love. It is only by turning unto God that the spiritual advancement can be made. In this sense, "sinning" is to follow the inclinations of one's own lower nature, to turn the mirror of one's heart away from God. One of the main hindrances to spiritual development is the Bahá'í concept of the "insistent self," which is a self-serving inclination within all people. Bahá'ís interpret this to be the true meaning of Satan, often referred to in the Bahá'í writings as "the Evil One." Watch over yourselves, for the Evil One is lying in wait, ready to entrap you. Gird yourselves against his wicked devices, and, led by the light of the name of the All-Seeing God, make your escape from the darkness that surroundeth you. This lower nature in humans is symbolized as Satan—the evil ego within us, not an evil personality outside. The Bahá'í concept of God is both just and merciful. God even forgives the most grievous of sins. Bahá'ís are meant to refrain from focusing on the sins of others, and are meant to have a "sin-covering eye." Bahá'ís are also forbidden to confess their sins to others in order to have their sins removed. Forgiveness is between a person and God alone, and is thus a very personal affair. Bahá'u'lláh taught that one should bring one's self to account each day, and be constantly concerned with self-improvement. Sin is an inevitable stumbling block, but it should not be allowed to halt one's spiritual progress. One should ask for forgiveness from God alone and then try to develop oneself through acquisition of virtues and communion with God (through prayer, fasting, meditation, and other spiritual practices). There are many Bahá'í prayers for forgiveness of oneself, one's parents, and even the deceased. The Bahá'í Faith teaches that pardon can be obtained even in the afterlife, and that deeds done in the name of the departed or wealth left by the departed for charity can benefit and advance their souls in the afterlife. All religions define sin, and most of them talk about various levels or kinds of sin, from more serious to less serious ones, like the three levels of sin (intentional, accidental, and unintentional sin) in Judaism. They also basically make a distinction between the act of sin and the state of sin, like that between actual and habitual sin in Catholicism. Also, all religions show paths of atonement for sin, giving rise to hope. The monotheistic religions believe that sin is volitional on the part of a human being who disobeys the will of God, while Asian religions such as Hinduism and Buddhism seem to attribute sin to karma. In spite of their volitional views of sin, however, the monotheistic religions posit Satan's influence on human sinning. Among the monotheistic religions, perhaps Christianity takes sin most seriously because of its doctrine of Original Sin, which is basically absent in Judaism and Islam. Even among Christians, those who adhere to the theory of natural headship take Original Sin most seriously, although they fall short of the sexual interpretation of the fall of Adam and Eve that would explain the theory very well. Amongst the several Christian theories of atonement, the ransom theory seems more reasonable than the others if the goal of atonement, in addressing the seriousness of Original Sin, is to defeat Satan's influence on human sinning and realize God's rule under which humans are encouraged to freely choose to do good things. ↑ Frederick W. A. Danker, Greek–English Lexicon of the New Testament and Other Early Christian Literature, 3rd ed. (Chicago/London: University of Chicago Press). ↑ H. G. Liddell and R. Scott, Greek-English Lexicon, 9th ed. (Oxford: Clarendon Press, 1995 ISBN 0198642261). ↑ Earliest citation, see Oxford University Press, Oxford English Dictionary (Oxford University Press, 1971), c.825. ↑ American Heritage Dictionary of the English Language, es-, Appendix I: Indo-European Roots, Bartleby.com. Retrieved January 21, 2008. ↑ For example, J. Denny Weaver, The Nonviolent Atonement (Grand Rapids, MI: Eerdmans, 2001). ↑ Muhammad bin Uthman Adh-Dhahabi, The Major Sins, rendered into English by Mohammad Moinuddin Siddiqui (Kazi Publications, 1993 ISBN 1-56744-489-X). ↑ Ibid. ; Muhammad Tahlawi, The Path to Paradise, trans. J. Zarabozo (IANA Books). ↑ In Sanskrit the wrongful act is known by several terms, including pataka (from pat, "to fall") papa, enas, kilbisha, adharma, anrita and rina (transgress, in the sense of omission). ↑ Satguru Sivaya Subramuniyaswami, Dancing with Siva: Hinduism’s Contemporary Catechism (Himalayan Academy, 2003 ISBN 0945497962), 826. ↑ Aryadasa Ratnasinghe, The uniqueness of Buddhism, The Virtual Library of Sri Lanka. Retrieved January 21, 2008. ↑ Bahá'u'lláh, Tablets of Bahá’u’lláh After the Kitáb-i-Aqdas (Bahá’í Publishing Trust, 1988), 87. Retrieved January 21, 2008. ↑ `Abdu'l-Bahá, 27 August 1912, Talk at Metaphysical Club, Boston, Massachusetts, in The Promulgation of Universal Peace (Bahá’í Publishing Trust, 1982), 287. Retrieved January 21, 2008. ↑ Shoghi Effendi, 111: Love–Unity (The Greatest Need), in Directives from the Guardian (1973), 42. Retrieved January 21, 2008. Hein, David. "Regrets Only: A Theology of Remorse." The Anglican 33, no. 4 (Oct. 2004): 5–6. This page was last modified on 19 September 2015, at 15:43.